The ‘Dead Lift’….for lower back rehab?????? After the positive feedback that I received following the previous post on the “jackknife” exercise, I will be posting some training materials that I have written in addition to the clinical materials. In reality, clinical care should always be transitioned into physical conditioning and the lines between them are often blurred…at least in the way that I approach my practice. Being the diagnostician, treating practitioner, rehab supervisor, and trainer is in my opinion one in the same. As I discussed in the post on the jackknife exercise, progressing the patient into more advanced physical training exercises is importance in order to both improve the patients performance, as well as to gain higher levels of strength and muscular control in order to prevent future injury occurrences. In the article below that I wrote for “Jits Magazine” (a magazine dedicated to mixed martial arts and jiu jitsu training), I discuss the performance of one of the best total body weight lifting exercises….the dead lift. Although references are often made to combative athletes, the article is just as relevant to any other athlete, or patient that walks through your door. I also added a video of some training partners, as well as myself performing the deadlift exercise at the end. When designing exercise programs for a particular sport, especially ones with several components and necessary skill sets like combative sports, it is important not to loose track of the main goal, which should be to build a better athlete. In order to achieve this goal we must first remember to develop a solid ‘base’ in order that the body will be better able to deal with the stresses of practice and competition. Although the newest catch phrases such as “sport specific training,” and “functional training” are in ‘fashion,’ proper and effective sports conditioning programs must first ensure the development of the basic tenants of athleticism: strength, speed, agility, and power. It is only after a person has developed a solid base in all of these areas that they should focus on training geared towards a specific sport or discipline. It is out of the scope of this article to discuss the most effective ways to develop in all of these areas. This article will therefore focus on just one of the basic tenants: strength. More specifically, we will focus on a single exercise that is more effective than any other in building pure, raw strength. Instances of injuries, false claims of danger, and the need to practice this exercise in order to master it often lead to it being omitted from strength and conditioning programs. However, this exercise has been a staple of ‘serious’ power lifters from the very beginning of their sport and is often termed the “King of Exercises” by some seriously strong men. This exercise is the deadlift. 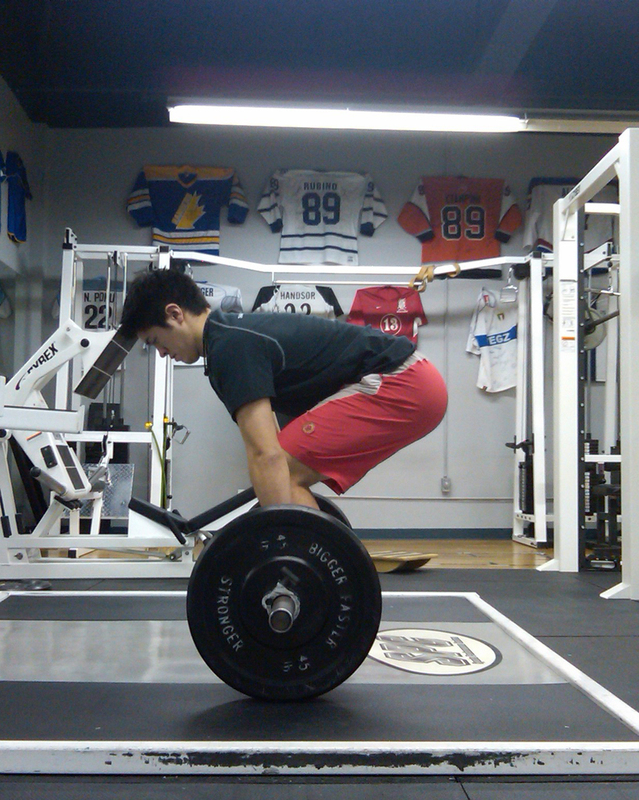 The deadlift is considered a “full body” exercise as it stresses several muscle groups simultaneously. The legs, lower back and core, the upper back, shoulders, arms, and even forearms are stressed during this “old school” lift. In terms of transferring skills from the weight room to the matt, ring, dojo, or cage, the primitive act of lifting weight off of the floor can be related to any combat sport. Perhaps most importantly, the deadlift conditions the lumbar spine to remain rigid during movement, which allows power to be transferred through the trunk. Take for example the act of throwing a punch. Any great heavy handed fighter will tell you that the generation of a powerful punch begins in the hips and pelvis, travels up the lumbar spine and core, through the shoulder, and out the arm. A weak core or lumbar spine causes a break in this chain (termed the “Kinetic Chain”) which causes power to be lost before it reaches its target. The deadlift trains several links in the chain, allowing for the translation of strength gains achieved with this exercise to be easily transferred to competition. As was previously mentioned, proper deadlift technique takes time to master and is commonly performed incorrectly; and an incorrect deadlift is a potentially dangerous thing. It is advised that you seek the guidance of an experienced trainer before you load up the bar and start lifting. In addition, many full books have been written outlining the proper mechanics of this lift, which may help you along the way. This short article is in no way going to cover all of the minor details of the deadlift. I hope only to outline some of the basic mechanics of the lift. Equipment – One of the best qualities of this exercise is the fact that it doesn’t require any fancy, expensive machinery (on a side note, most exercises performed on fancy machines are of very little value in sports conditioning). All that is required is a standard long bar with some plates. Even wearing shoes is optional! In fact, I recommend performing the lift bare foot in order to ensure maximum force transfer from your feet to the ground during the lift. If you can’t fathom going barefoot in your gym, wrestling shoes will work almost just as well. Avoid using shoes with a great deal of cushioning as it will lead to a loss of force which means you will not be able to lift as much weight (by the way, the same reasoning applies to not wearing gloves during upper body exercises). Breathing – There is much controversy that exists about breathing patterns during exercise. Somewhere along the history of conditioning, someone must have falsely exaggerated the incidence of cerebrovascular accidents (ex. strokes) that occur in the weight room. This lead to the misinformed concept that holding your breath during lifting is dangerous as it causes a spike in peak blood pressure during exercise. Further, it lead to the idea that it is safer to inhale on the lowering eccentric portion of the exercise, and exhale on the lifting or pushing concentric portion in order to keep your blood pressure low. What this idea fails to take into account is that when you hold your breath and bare down during a lift, in addition to increasing pressure in the blood vessel in the brain, an equal pressure increase also occurs in the cerebrospinal fluid (the fluid that ‘baths’ the brain and spinal cord), which counter balances the vessel pressure. Ergo, the pressure pushing in on the vessel will cancel out the pressure pushing out on the vessel. In addition to this, pressure increases that occur in the abdominal and thoracic cavity help to stabilize the spine and thus help to prevent spinal injury. In terms of strength, studies have demonstrated that during a lift, you are the strongest if your breath is held, followed by breathing in during the lift. Thus breathing out puts you at your weakest. Conclusion…take a breath in before the lift and hold onto it until the lift is done. Figure 2: When in the starting position the shins should be touching the bar. The alternate grip demonstrated makes it easier to hold the weight. Pre-loading – the deadlift requires the production of force from a “dead” stop (hence the name). This is one of the reasons why this exercise is so effective in the development of ‘raw’ strength. However because of this fact, there is a tendency for people to want to ‘jerk’ the weight off the ground. Not only will this decrease your chances of lifting the weight, it will also ensure you a trip to the emergency room due to spinal injury. This exercise is intended to be performed slowly, and deliberately. Before you attempt the lift, take your breath as has been discussed, tighten every muscle in your body including your grips, then gradually exert a slowly increasing force on the bar until it leaves the ground. If you perform the lift in this fashion, you will significantly decrease the chance of a lower back “blow out”. The Lift – As previously stated, reading this article will not make you a master of the deadlift. These are just a few of the pertinent points regarding the lift. The sequence of opening (or straightening) the hip and knee angles is of utmost importance. In a correct deadlift, the knee angle is the first to change as the bar leaves the ground. From the floor to the level of the knees the bar should remain in contact with your shins. The hip angle should remain fairly constant until such time that the bar clears the knees. 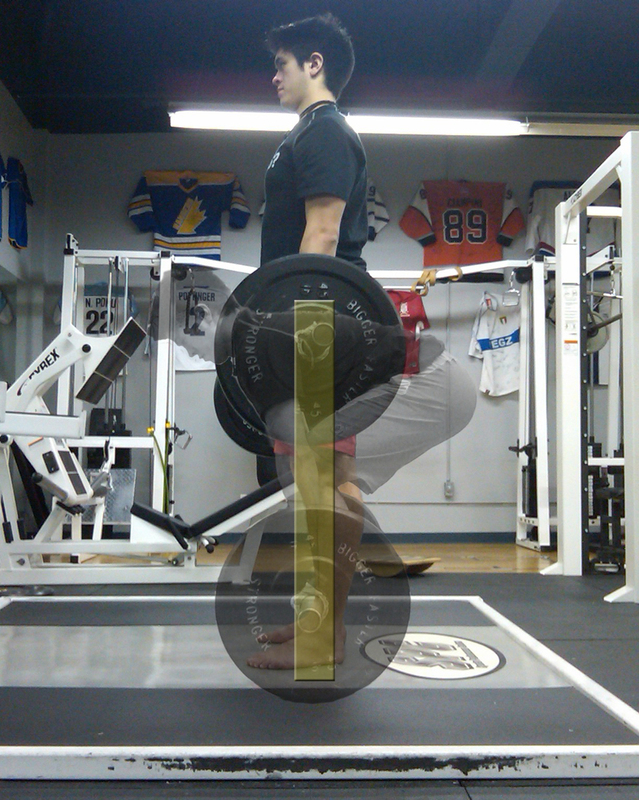 After the knees are cleared, hip extension becomes the major movement for the rest of the lift until you are vertical. When viewing the lift from the side, the path of the bar must be in a straight line from the beginning of the lift until the end (Figure 3). Lowering the bar – Unlike most exercises where the lowering of the weight (the eccentric portion) is just as important as the lifting, with the deadlift the ‘lift’ (concentric portion) is the goal. Thus lowering the bar does not have to be controlled, so long as it is done safely. Rapidly lowering the weight while maintaining your grip is acceptable considering that the amount of weight used during deadlifts is often high and thus would create a high amount of stress on the lower back during lowering. Lowering of the weight should be done the exact opposite of how the lift was achieved in terms of hip and knee angles. When lowering, ensure that you ‘close’ the hip angle first, and then the knee angle second (which is the opposite of the lift – see above). Obviously one must ensure that the gym floor is built to withstand such a force (using a power lifting platform is always best if available). Of course as with any exercise, it is advised that you begin with light weight until the technique is mastered. Small load increases then can be applied over time as strength levels increase. Building a base of athleticism should be the first goal in any sports conditioning program. Strength is one of the basic necessities in high level sports performance whether you are hitting a ball at the end of a racquet, projecting a ball over a great distance, or lifting an opponent in the air during a double leg take down. A strength-building program that omits the deadlift as one of the main exercises is, simply stated, a less effective program. functionalanatomyblog.com’s done it once more. Great read.